You can see here two details of the painting 'Peasant parlour with noble visitors' by Antwerp painter Martin van Cleve, dated around 1566. At the time I saw this little wonder in Vienna, I had just presented a paper on children's dress in the 16th century, so this painting really caught my attention. Peasant parlour with noble visitors (detail), around 1566, Martin van Cleve, Kunsthistorisches Museum, Vienna. 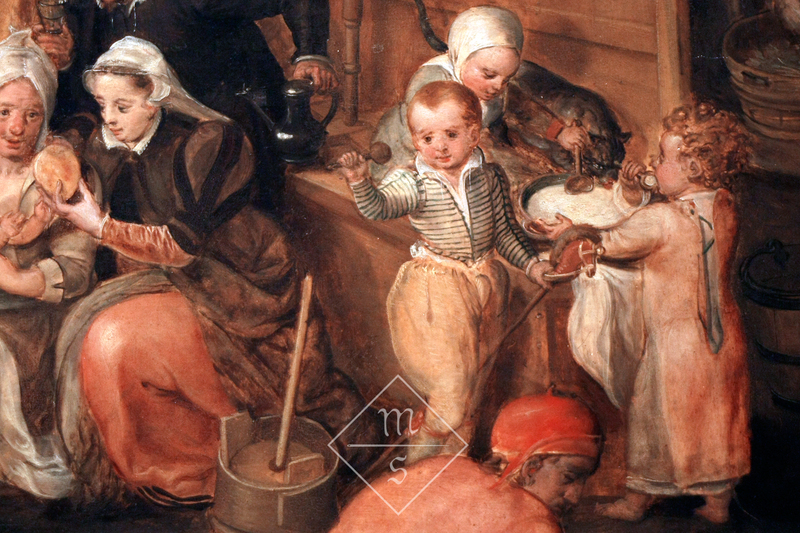 What makes this painting particularly interesting is that it shows the clothes of both poor peasant children and a boy that clearly belongs with the 'noble visitors'. This boy wears a doublet and knee long breeches with a codpiece(!) and white stockings. My guess is that he would be around five or six years old (but I'm not good at guessing children's ages at all, so if you disagree let me know). At about this age, boys generally went from long coats* to wearing breeches, like grown up men. ** However, the boy next to him, of about the same height and age, still wears a long coat (with back lacing!) over a simple shirt. So, what this painting tells us, is that the moment of breeching wasn't only determined by age, but probably also by social standing. After all, as children grow, breeches last less long than a coat before needing to be replaced. Breeches moreover require the wearing of linen underpants, which need to be washed and laundered as well. For farmer's families having their children walk around in coats for a little while longer was most likely a strategy to save both money and time. In the bottom image you can see a girl wearing a type of headdress that is also often seen on depictions of little girls in the paintings of Pieter Brueghel. Her really short sleeveless dress shows again how long garments were worn, even when they were already a few sizes too small. * I call this garment, that is usually called 'tunic' or perhaps 'kirtle', a 'coat' (the equivalent in French being 'cote' which is clearly related to the English term, in medieval Dutch: 'rock' and in medieval German: 'rock/roch' , because this is the term used to describe this garment in late medieval and early modern written sources. 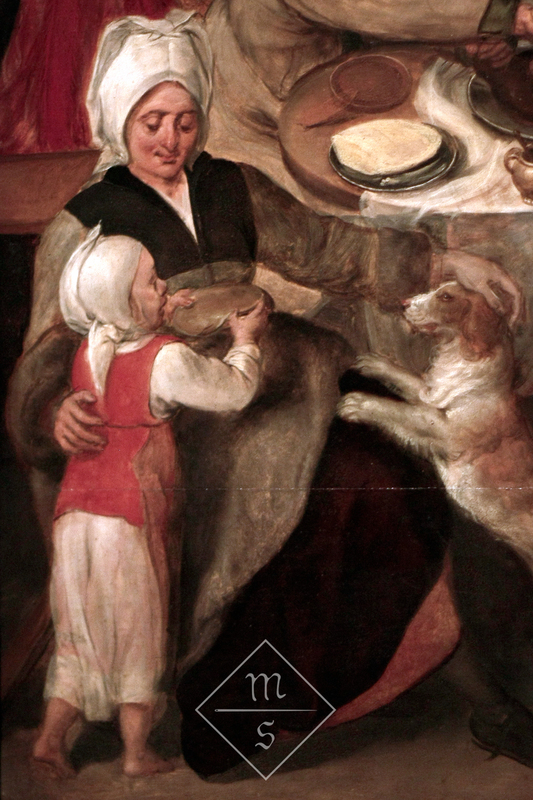 That coat/cote and rock/roch are the same garment, becomes clear in Flemish sources, which often use a mix of French and Dutch words, and where 'cote' and 'rock' are used interchangeably. 'Tunica' or 'tunic' is the Latin name for this garment or course, so it isn't wrong to use it per se. As far as I know, however, a 'kirtle' or 'keurs' is a specifically female garment that usually has a tighter fitting bodice than a 'coat/rock'.